For the 2016-17 NFL season, Toyota and Yahoo! 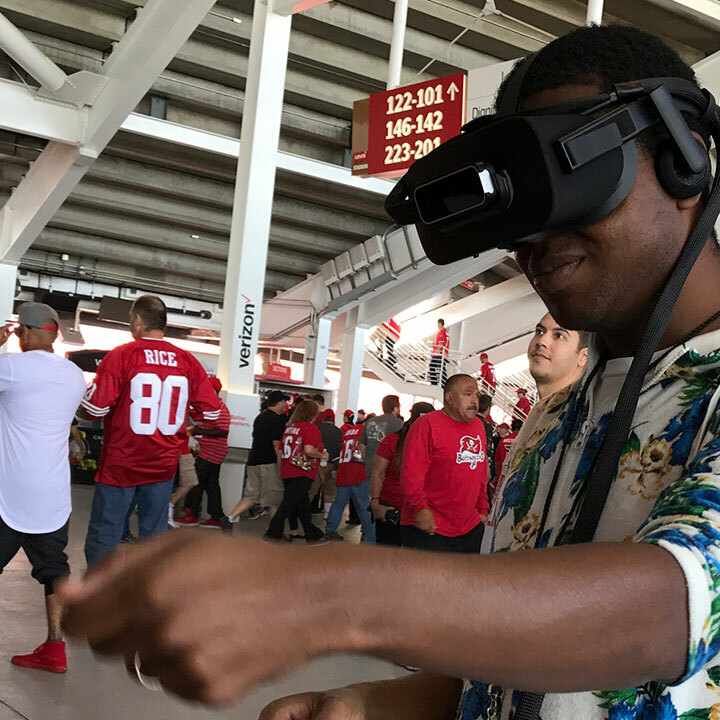 wanted to ramp up the Fantasy Football Hall of Fame at Levi's Stadium, home of the San Francisco 49ers, exposing fans to a cutting edge VR experience at each game. Even in the heart of Silicon Valley, few consumers have had the opportunity to put on a VR headset first-hand -- until now. We used it to wow fans with the spectacle of our virtual Hall of Fantasy Football, then went further with an interactive game to show just what it takes to be Hall of Famous. Living at an existing installation alongside interactive touchscreens and our Kinect-powered "Throw A Fantasy Football" game meant the Toyota Hall of Fame's foray into VR couldn't be a passive viewing experience. We embedded Oculus Rift headsets with Leap Motion VR, allowing anyone to reach into virtual reality with their bare hands. The Leap Motion uses infrared sensors to track user's hands and fingers on the fly, which meant we could challenge users to create their very own bronze Hall of Fame busts, just like the real fantasy players who have been inducted before them, by picking up a smorgasbord of virtual hammers and tools to start swinging away. They quickly found out whether or not they had the magic sculptor's touch while the crowd watched on linked monitor displays.